First off, a very Happy New Year to you all. Well – 2011 can’t be said to have been the best imaging year on record, in fact I think it is fair to say that it is the worst imaging year overall I have recorded in my log book – and that goes back to September 2004. Let us at least hope for a better year, weather-wise, this year. So what is this month’s Imaging Object of the Month? I have decided again to steer clear of the Orion goodies and move to nearby Auriga. Now Auriga usually means IC410/IC405 the Flaming Star nebula – but lying very close by there are a bunch of very nice open clusters and some smaller regions of emission nebulosity. So my Imaging Object for this month is the M38 open cluster region in the constellation Auriga. 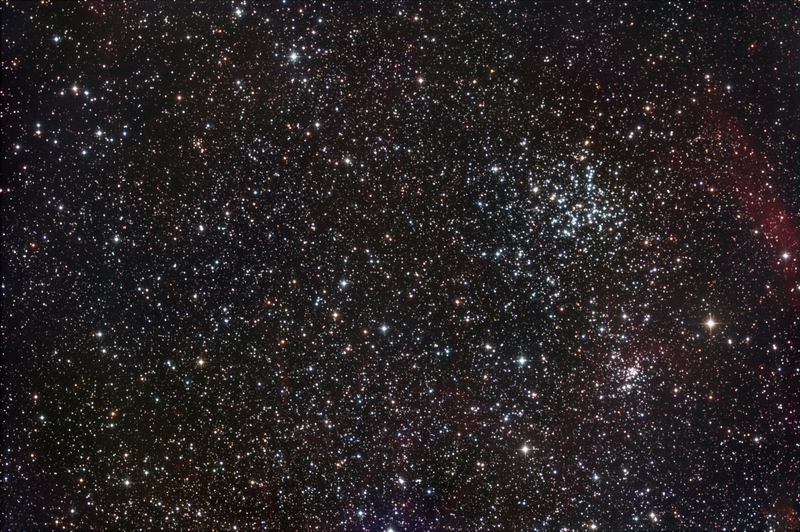 M38 (NGC1912) is quite a sizeable open cluster at 15 minutes in diameter and pretty bright at magnitude 6.4. Lying just underneath M38 you can see another little open cluster – NGC1907 – which very nicely offsets the subject of the image, M38. 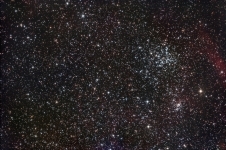 I have both clusters offset from the centre of the image as this is part of a much larger mosaic which will eventually include M36, IC417, IC410 and IC405. As per usual with any open cluster you don’t need to use particularly long subs but as I wanted to catch the outer fringes of all the emission nebulosity surrounding IC410 and IC405 (which you can see towards the top right of the image) I used 5-minute subs with the fast f#2 Hyperstar III system – so this image goes pretty deep. As usual, you need at least 4 hours worth of data to start getting on top of the noise in the faint regions. Plenty of stars, plenty of faint nebulosity, the M38 region is certainly worthy of your valuable imaging time.